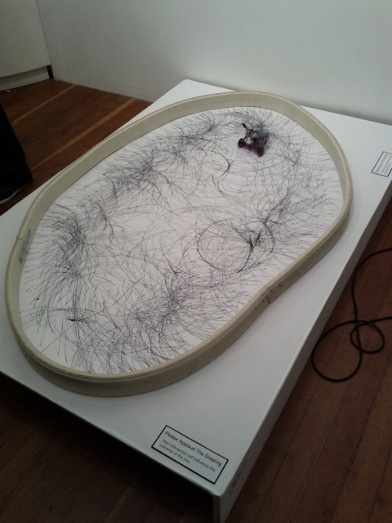 Auto-Mated: The little four-wheeled robot draws; the audience’s applause helps direct its activity. The title of the current group show at the gallery Robert Berman / E6 in San Francisco, Say Something!, is an invitation to the verbal — which is to say, to the spoken and, thus, to the heard. So, it’s no surprise that several of the pieces take sound as their source material and subject. Welcoming visitors close by the entrance is Jordan Kantor’s oil-paint rendering of the title of the album Raw Power by Iggy Pop and the Stooges, its font consistent with the original but the words reproduced on a blank white backdrop. Is it a challenge to the viewer, or to the staying power of those words and the music whose ferocity they announced? Perhaps both. On opening night, this past Saturday, January 15, two pieces in particular appeared to embrace aurality: one an exercise in interactivity, the other an inspection of a San Francisco classic. There is only one voice in Tom Comitta‘s “Howl in Six Voices: an Inflationary Erasure of Allen Ginsberg’s ‘Howl'” and that is the voice of the poet himself. Comitta located a recording of Ginsberg reading his best-known poem, and then edited it based on carefully defined procedures. The result is six different takes on the poem, each reproducing in sequence only the words containing a specific vowel (the sixth track adds “y” to the standard “a,” “e,” “i,” “o”, and “u”). 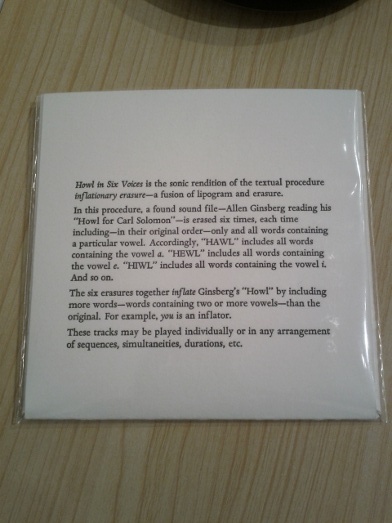 The tracks are collected on a CD protected by a letterpress cover that presents the work’s procedural recipe, and also takes the ephemeral product — the sound recordings — and makes them contained, collectible, possess-able, albeit to a limit: Only 50 were copies produced. Each of the six renditions translates the familiar verse into something hallucinatory. The original emerges in your memory, hitting the cues provided by the fragmented phrases of Comitta’s reduction. His precise efforts suggests a distant, straight-edge cousin to the cut-ups of Ginsberg contemporary William S. Burroughs. More on the gallery, which is located just off Market Street, at e6gallery.com. The Say Something! exhibit runs from January 13, 2011, through February 19, 2011. More on Foucault at peterfoucault.wordpress.com. Comitta’s site, tomcomdotcom.com, has a “coming soon” notice. Postscript: As always, this site is focused on the intersection of sound and art. 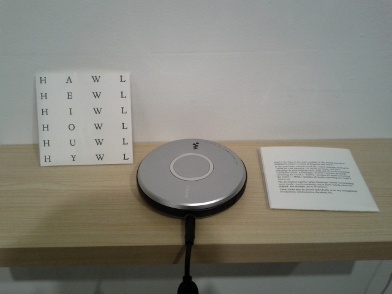 There’s non-sound art in the Say Something! 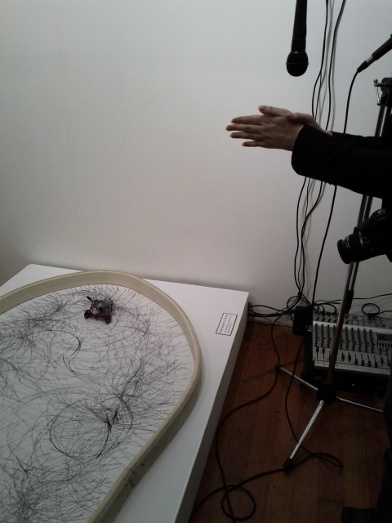 exhibit, and other pieces that have sound to some extent, such as video. The gallery’s website has a full list of participants and numerous photos of the installed art.